The price of outdoor furniture is shocking, but building your own is simple! Here are 5 DIY outdoor sofas you can customize to fit your deck or patio. From DIY outdoor sectional plans to a simple 2×4 outdoor couch, you can find it here! Spring is finally here, and that means summer is just around the corner! 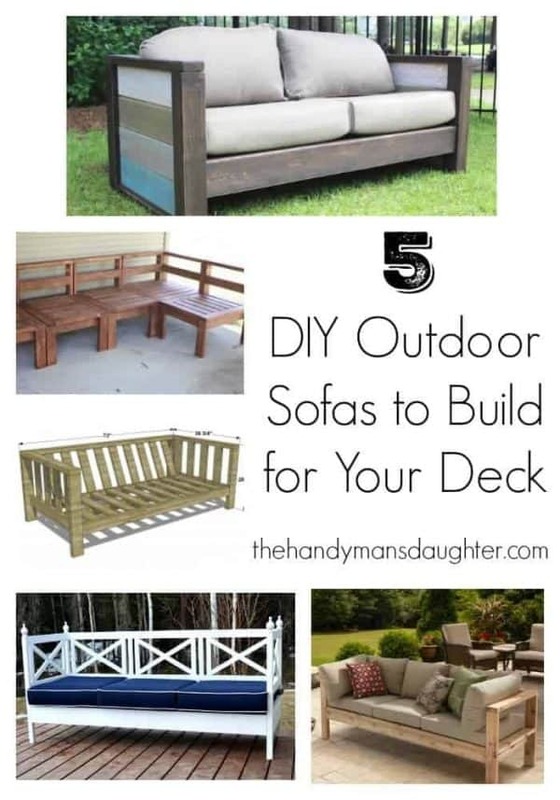 Our deck is one of our favorite spots to hang out, and I’ve been scouring the internet checking out DIY outdoor sofas to make it a relaxing retreat. You’d be surprised how easy it is to build an outdoor couch, and you’ll save a bundle too! These are my five favorite DIY sofa and couch plans to get you started. This post contains product affiliate links. For more information, you can check out my disclosures page here. We had our deck rebuilt a few months after we moved in, and stained it after letting it weather for six months. We bought a cheap IKEA table and chairs, and received a fabulous grill from my in-laws as a house warming gift. But we didn’t have a spot to kick up our feet and relax with a good book. I don’t want another summer to go by without a comfy outdoor sofa, so I’m started my building plan search early. We have enough space in this corner for two outdoor sofas, or a small sectional. Cushions are usually the most expensive part of outdoor furniture, so keep your eyes open for deals over the winter (I scored mine on clearance!) 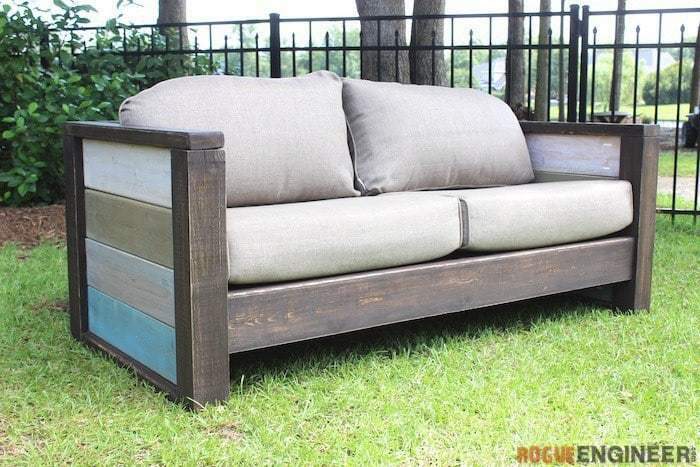 Then build your DIY outdoor couch to fit! I compiled a list of DIY outdoor sofa plans that are easy enough for a beginner to tackle. There are so many fabulous ideas here, I’m having a hard time deciding which one is my favorite! 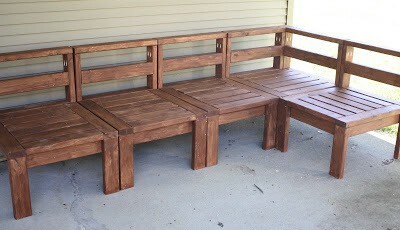 Ana White’s plans on Ryobi Nation create a fairly simple DIY outdoor sofa that can be built quickly. This 2×4 outdoor couch is made of cedar, which is weather resistant and extra sturdy when kiddos are jumping on it! 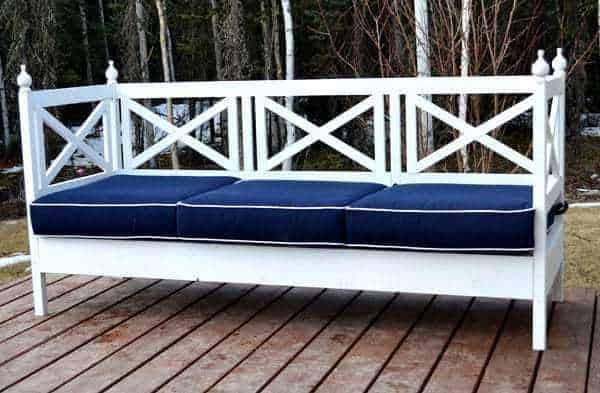 There is also a DIY outdoor sectional version of the same sofa, or get my DIY outdoor loveseat plans in the woodworking plans library if you need a smaller size. I love the angled back on the Reef Sofa from The Design Confidential. A slanted back support would be much more comfortable for lounging purposes. The slats on the arms would also help keep pillows from falling out during impromptu outdoor naps! How gorgeous is this planked wood loveseat from Rogue Engineer? It would be pretty easy to stretch this out to a full sized outdoor couch, and would add a nice pop of color on the deck. If I go the sectional route, a modular DIY outdoor sofa like this beauty from More Like Home would be perfect. It would be easy to add more sections if we decide to make it bigger, and we can even use the armless sections as extra chairs at the table for guests! And finally, we’re back to another Ana White build. 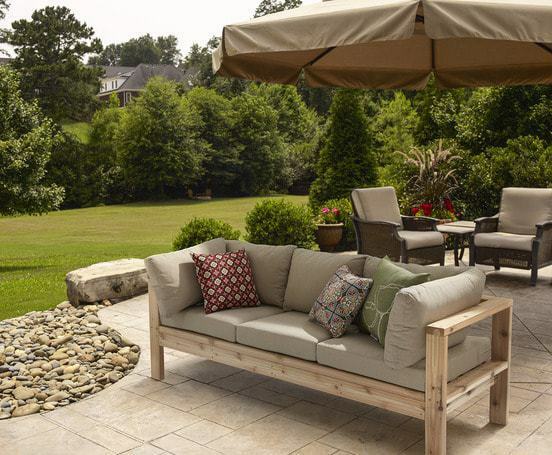 I’m drooling over her Weatherly outdoor sofa, which also includes sectional sofa plans! I would probably leave off the finials so no one impales themselves after a few too many drinks. 🙂 But the X design is truly eye-catching. All of these DIY outdoor couch ideas would look great on your deck or patio! Which one is your favorite? All the sofas you picked are great and just as I am looking for outdoor sofa ideas, too. I love that one too. I’m just not looking forward to all the work it would take to make all those X’s perfect! The first one is my favourite as well, it looks awesome! How clever that you got such a good deal on cushions at Pier 1! That’s awesome! Thank you so much for linking up at Sweet Inspiration #1, hope to see you again next week! I’m glad to be a part of your first link party. Here’s to many more! I don’t have a deck yet but these are great for when I finally get one 🙂 Think i will go sectional! Oooo it’s hard to chose! I like the Reef sofa the best. You got an amaIng deal on the cushions!!!! Especially from Pier One. I heart that store but am more of a window shopper there. I do have two cute sofa pillowa i got there for a steal… $5 each! WOW!!! What a great idea! I definitely want to try one this spring! Thanks for the ideas! What a great round up. Thanks for sharing at You’re gonna love it! Pinning! What a great round up of projects! Thanks for putting it all together!! I have been looking into building outdoor furniture as well! And like you having a hard time deciding what to do. You have given me a couple more great ideas. It was hard to decide, but I went with the quick and easy option (the first one on my list). My new outdoor sofa is already finished, and it came out great! Now it s time to see what my friends created for thier patios and porches. I m loving this month s projects with so many budget friendly DIY s to kickstart the outdoor season and pretty weather! Great choice of furniture. 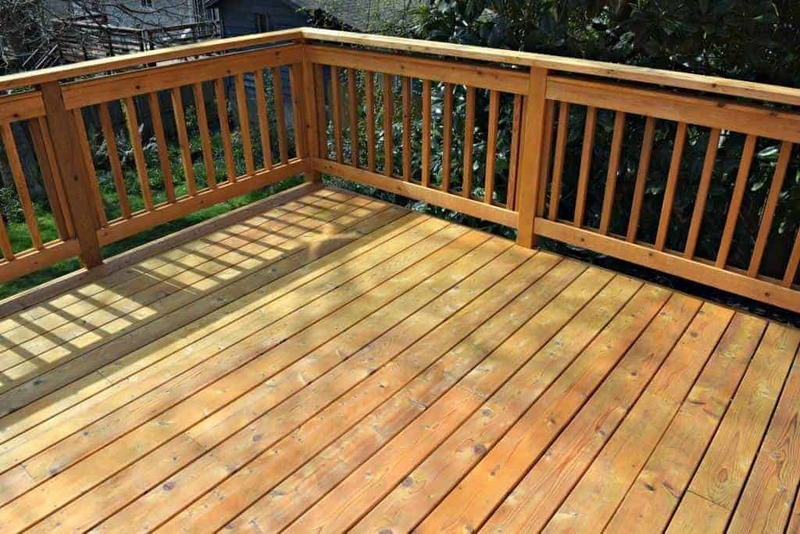 I am also thinking of renovating my deck and add new furniture to enhance it’s look. Thanks for the creative ideas. I want my patio or garden also to look cool. I want the design on park benches to be on my furniture in lawn. Really cool. Renovating or remodeling your home is a sure way to increase the value of your home and property. Vineta, is there is a specific kind of wood that you advise for an outdoor sofa in cold/rainy weather? Cedar is definitely the go-to wood for outdoors because it won’t rot, and it’s easy to find at home improvement stores. The outdoor sofa and loveseat I built out of cedar have been sitting out for the entire rainy Seattle winter and still look brand new! Looks interesting! I’d like to make my patio looks like this soon. Very inspiring–love all those! Thanks for sharing. These sofa designs are gorgeous and add so much style and comfort to an already eye-catching deck. Thanks for sharing! I should have done this before, but I was having a hard time with the decking boards. Thank you for sharing your ideas. I will note this!